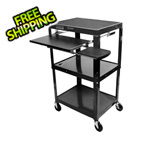 Get going with Luxor's Adjustable Height A/V Table with Big Wheels, Cabinet and Keyboard Tray, Model AVJ42KBC. 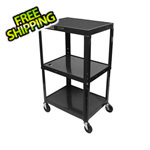 It's the perfect on-the-go media cart. 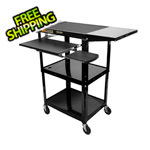 It features a pull-out keyboard shelf, making it great as a stand-up computer station as well. 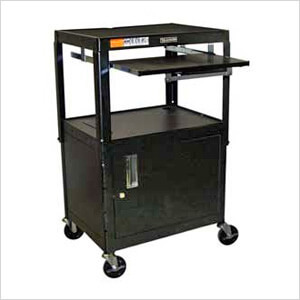 And, with its large 8" wheels for extra load bearing, a locking cabinet, and a three-outlet electrical unit that makes mobile powering easy, this cart can't be beat.